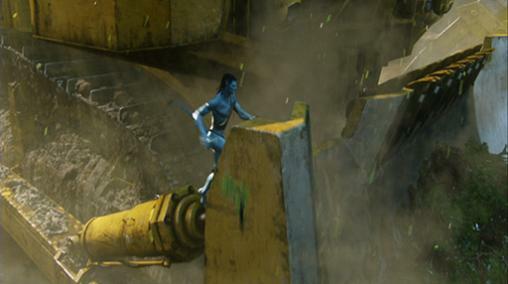 Remotely Operated Bulldozer | Pandorapedia: The Official Guide to Pandora | Own AVATAR on Blu-ray & DVD Now! If the RDA truly builds better worlds, it starts the long, expensive and politically sensitive process with one of its most basic tools-- the heavy dozer. As the need for raw materials has driven human society to tear into the skin of its own planet with greater ferocity, these enormous machines have met that task. Their terrestrial uses have translated well to Pandora, where they are used to clear the enormous forests for construction site prep and road building, and to keep the local flora from overtaking what has already been cleared. These juggernauts are also used in the removal of overburden in mining operations. An armored camera mast supports an array of cameras which give the remote human operator many options for imaging the work site. In addition, forward sensor arrays under the front cowling, including ground penetrating radar and ultrasonic probes, scan ahead to determine soil depth, underlying geology, and the chemical components of the soil. The onboard geophysical analysis suite profiles the entire work site to a range of 200 meters and a depth of 20 meters, and, within seconds, the computer derives the most efficient procedure to achieve the goal. This grading plan is then displayed for evaluation by the human operator as he or she proceeds with the work. Operator stations are housed within the OPS Center at Hell’s Gate. The D-22 dozer has a front-mounted, huge single scoop shovel, and in the rear, a backhoe, both operated hydraulically. The machine travels on treads made of permalloy for a long operational life. Often the machine operates in semi-autonomous mode, making most decisions on its own as the human operator monitors its progress. Only in difficult terrain will the remote driver take over to operate the machine directly. There are several emergency features, including various procedures related to a broken shovel, protocols regarding the discovery of archeological and paleontological finds, or the unexpected presence of an aboriginal. In such instances, the dozer's propulsion shut down automatically. To ensure efficient work, however, those safety features can be "tuned low" so that it takes a major disruption to trigger a shutdown. The D-22 is the front line of the RDA’s taming of the Pandoran wilderness. It is designed to chew into the planet's topsoil to build roads for the expanding human presence, and to haul away the overburden in mining operations, flatten terrain for new construction sites, and dig holes for foundations. After decades of success in the last jungles of Earth, the D-22 required little or no adaptation for use on Pandora. Function Remotely piloted site clearing and preparation, road building, mine operations. It is the most massive land vehicle on Pandora, and one of the largest land vehicles in existence anywhere. Size Wheelbase is 39.7 meters long, 26.93 meters wide, 13.35 meters in height. Notes Na'vi consider the remotely operated dozer to be one of great evils brought by human colonists and both fear and despise it.